My good friends, Phil Zarrow and Jim Hall, in their award-winning audio series “Board Talk,” were recently asked about the “Five Ball Rule”. In the comments section for this session, one listener asked if this rule, created in the 1990s, was still valid. After all, the 1990s was the era of 0603 and 0402 passives; 01005 and even 008004 passives have arrived. First, let’s consider what a “rule” is verses a “law.” As an example of a law, consider Newton’s Laws of Motion. At everyday speeds, these laws are shown to be accurate to within our capability to measure. As we will recall from Physics 101, these laws were superseded by Einstein’s Theory of Relativity, at speeds close to those of the speed of light. However, in our everyday world, Newton’s Laws are well……..laws. They are, for practical purposes, exact. 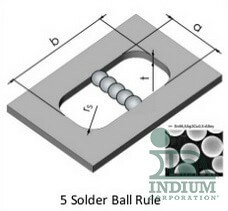 What is the “Five Ball Rule?” It states that the solder paste's largest solder particle diameter should be such that at least five of these particle diameters would span the width of a rectangular stencil aperture. See Figure 1. When this rule was developed, stencil apertures were much coarser than today, and the finest solder powder was a Type 3, with Type 4 on the horizon. While it is true that stencil aperture widths are much finer today, solder pastes of Type 4.5, 5, and even 6 are now in use. 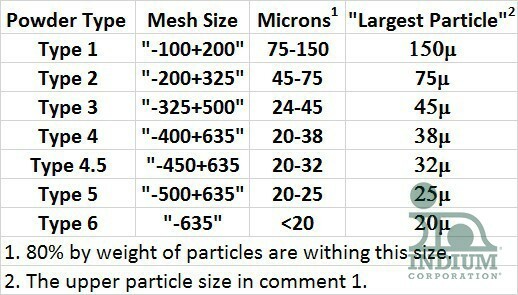 StencilCoach™ software now includes the newer (finer) solder powder sizes to 1) tell the user the fineness of solder paste powder for the Five Ball Rule, as well as 2) help with calculating aperture or area ratio. By the way, some have suggested that, for a square or circular aperture, an “Eight Ball Rule” is more appropriate. So, StencilCoach™ uses the Eight Ball Rule for such apertures.